Spielberg hits a couple of false notes. One is that he lets go of the realism that anchors the comics, falling prey to the video game tie-in sequences that tend to plague most big budget animated features these days. I really don’t understand the compulsion to go Bugs Bunny on the characters in the way it’s occasionally done, or to drown a perfectly good chase scene in impossibly craning camera movements and outrageous defiance of the laws of physics. Good, earthbound action would have been sufficient, and much more in step with Hergé’s ambitions. The other irritation factor is the transformation of Haddock from hopeless drunk to hero. The character is generally well characterized; Andrew Serkis does a great job of tempering menace with softness (though I miss the nightmarish sequence from Crab where he takes a corkscrew to Tintin’s head). 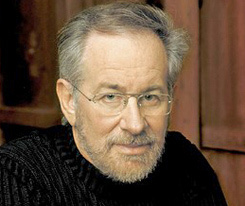 However, the cookie-cutter Hollywood self-help narrative Spielberg and his writers graft on to the character, as well as the unnecessary generational revenge plot they apply to his conflict with the villain, are far from the spirit of the original. For Hergé, the “real Haddock” is not a swashbuckling conquistador kicking the bottle, but precisely an unstable drunk with a moral center. The moral codex of the world is written by the characters, not inherent in their souls. 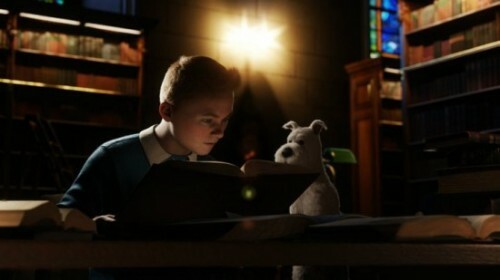 It seemed to me that Spielberg is aware of some of these issues, and perhaps even that Tintin calls for the subtle but unmistakeable presence of the author. I may be going out on a limb here, but it struck me from the very first appearance of the villain Sakharin that he resembled the filmmaker and might be a wry self-portrait. In the original book, Sakharine is a Russian collector, a poor victim of the villains’ plot, while in the film he is elevated to major badness. With success I might add. I wonder whether the “sugary name” that Haddock references in his introductory scene might be a bit of ironic self-reflexiveness on Spielberg’s part. After all, he is one of the major purveyors of candy floss on celluloid of the past decades and he is probably quite aware of the ethical vision he is imposing on the Tintin universe here. More profoundly, it might even be his commentary of Hergé’s rather notorious anti-semitism. 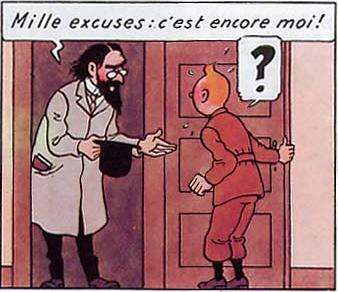 The Secret of the Unicorn (1942-43) does not repeat the sins of his previous story The Shooting Star (1941-42), but anyone familiar with Hergé’s humanist shortcomings would recognize the pattern by which stereotyping emerges from his work, even when he is trying hard to avoid them. Sakharin as Hergé drew him is one such instance, though far from as malicious as those in the previous book. It would make eminent sense for Spielberg to acknowledge this troubled aspect of Hergé’s work — work he clearly loves — by making the villain of his piece recall the original author’s semitic caricatures and by lending his own features, the features of the present author, to the character. This is all probably idle speculation on my part, but I think it would be a poignant and slightly barbed but ultimately quite touching gesture on Spielberg’s part, now that — for better or worse — he has assumed a natural and quite commanding place in the development of Hergé’s legacy. 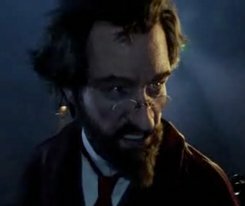 I pegged the villain as a Spielberg caricature in the first second I saw him in the trailer. It is unmistakable. If it’s for the purpose of counterbalancing Hergé’s anti-Semitism, then good for Spielberg. But as a narrative device, it creates a huge stumbling block, at least for me. It is too noticeable and self-conscious, in a movie that already distances the viewer from engagement, due to the execrable and pointless motion-capture system of “animation”. Speaking of which, I absolutely fail to understand why Spielberg, or anybody else, thinks this technology is a good idea. It seems to work when a character is inserted into a live action film, but as the entire film, forget it. With Hergé’s beautiful “clear line” available as inspiration, why in the world, for all the money spent, didn’t purported animation fan Spielberg do 2-D animation? It could have been a thing of beauty. In a way, I understand why they chose not to imitate Hergé’s clear line. It would have been an exercise in futility to try to capture the visual magic of the comics on film, I think (all previous attempts have been uniformly dreadful for what that’s worth).